Display screen equipment (DSE) – any alphanumeric or graphical display screen and includes not only computer equipment but also microfiche, liquid crystal displays and process control equipment. The definition does not include television sets unless they are in use for activities such as editing of material. User/ Operator – a person who habitually uses display screen equipment as a significant part of his or her normal work. Workstation – an assembly comprising display screen equipment, optional accessories to the display screen equipment, disk drives, modems, printers, telephones, document holders, chair, work desk or work surface or any other item peripheral to the DSE and the working environment around the DSE. Are you a DSE ‘user’? Do you use computer or display screen equipment as a significant part of your normal work? Some examples of DSE users are admin staff, secretaries, accounts enquiry operators employed on mainly full time display screen use or graphic designers working on multimedia applications. You have been allocated a new workstation. Working practices are altered or new software is introduced. Significant changes are made to the lighting. The workstation is to be used by a different operator. At regular intervals e.g. Every 2 years. Who should carry out assessments? The DSE assessments task may delegate to members of staff however they must ensure that they have been given sufficient guidance and training to enable them to perform the assessment competently. An individual should be able to undertake DSE assessments as soon as they start working with display screen equipment. This will identify that they are a user and whether an eye sight test is appropriate at this stage. The information provided on this webpage, together with the additional material contained in the DSE assessments classroom based training package, will equip individuals to undertake a competent assessment. The manager should ensure that DSE users are given sufficient guidance and training to enable them to carry out minor alterations or adjustments to the workstation, however, the appropriate supervisor or manager should be notified of any alterations to allow a judgement to be made on the likely need for a review of the risk assessment. DSE assessments should consider the workstation including furniture, equipment, the working environment and the job design. Equipment such as mouse, monitor, key board. Furniture such as Chairs, Desks etc. OK, so how do I carry out a DSE assessments? 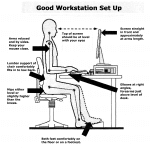 By following the simple 12 steps laid out below most staff should be able to carry out DSE assessments of a workstation competently. Print out the Computer Workstation Assessment Checklist and use it to record your findings. This guide will help you consider firstly the furniture and equipment that comprises the workstation. 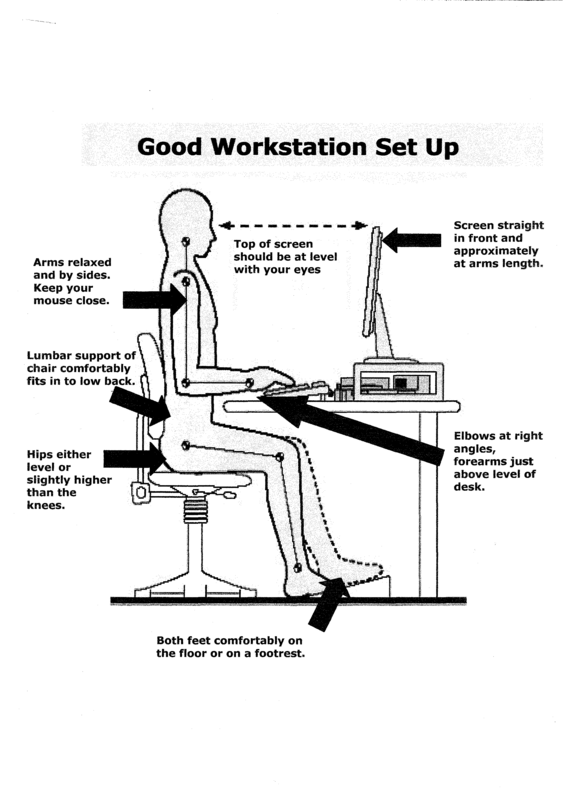 It will then give some guidance on making adjustment to the workstation to suit the individual user. Now work through each of these steps – but remember, if you are in any doubt about what you are doing – STOP – and seek assistance. The 12 Steps to set up a workstation for a DSE Assessment. Adjust the chair back angle for support; this should be fairly upright when typing. Adjust the seat height so that your elbows are just above the desk (relaxed shoulders, vertical upper arms, elbows bent at right angles). 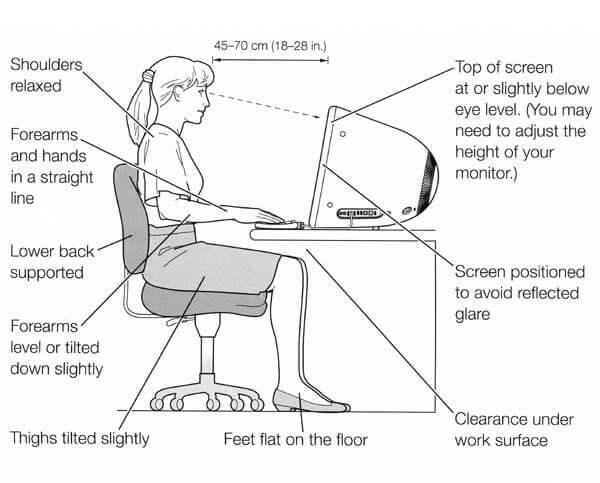 The keyboard should be directly in front of you and at a distance to allow you to maintain relaxed shoulders, elbows at right angles and a neutral wrist posture. 3. Screen reflection & glare. 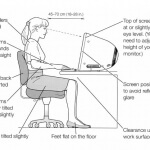 Screen height should prevent excessive movement of the head and neck. Top of the screen at or just below eye level. This will depend on typing style, software used, glasses worn and tasks performed. Screen tilted back slightly. Lighting should be sufficient for the task. Workplace temperature should be at least 16º C. Draughts should be reported. Noise that distracts or affects concentration should be reported. 7. Equipment position & work area. Don’t cradle the phone between shoulder and chin. Hold the handset or consider a headset if you frequently use the phone and PC together. Make sure the area around your desk is free from obstructions& trip hazards. Organise your work so that you that you have reason to get up out of your chair and away from your workstation at least once an hour, e.g. collecting documents, filing. As far as possible, do not locate printers on your desk or within reaching distance. Ensure you are aware of your entitlement to eye and eyesight testing (even if you already wear glasses). See your optician for a free eye test. Have regular eye tests. Follow your optician’s guidance on repeat eye testing usually every 2 years. Software should be suitable for the tasks performed. You should understand how to use the software to perform the tasks required. If you experience any aches or pains or headaches which you feel may be related to your workstation use, you should inform your manager in the first instance. Always seek medical advice about health concerns. If you have any problems related to the use of any workstation, you must report them to your line manager or local safety coordinator as soon as possible.